In their fourth trip to true team state, the PAHS Bulldogs girls' track team earned their highest finish ever on Saturday at Stillwater High School, finishing fifth in Class A. The Dogs surpassed their best-ever previous finish of sixth in 1996 by taking fifth out of nine teams on Saturday. The Dogs improved from seventh at state last year and ninth in 2004 in their third straight year at state true team. Rushford-Peterson/Houston won the Class A title, with Sauk Centre, a conference rival of the Dogs, taking second. The Dogs edged Sauk for the section true team title two weeks ago, but the Streeters qualified for state as the wildcard and took second with six first-place finishes on Saturday. 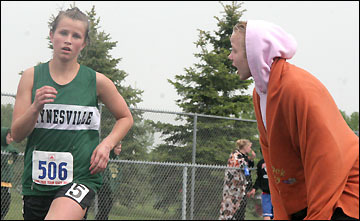 Ninth grader Ariel Jones cheers on junior teammate Kacy Nehowig during the 3,200-meter run on Saturday at Stillwater. Since every place counts in true team, every athlete scores team points under this format. "The girls' track team had a great performance at state on Saturday, recording their highest finish at state true team," said coach Dave Randgaard. The Bulldogs also improved their placing (fifth, up from seventh) and point total (344, up from 307) at state from last year, added Randgaard. Sauk Centre's strong showing at state, capped by junior sprinter Megan Quistorff, a Division I prospect winning three races, showed what a great meet the Dogs had at sections to beat the Streeters and qualify for state, said Randgaard. The Dogs, who reached as high as second momentarily on Saturday, battled with Blue Earth Area for fourth most of the day, with last year's champion Cedar Mountain/ Comfrey/Springfield barely ahead in third. In their duel, Paynesville and Blue Earth exchanged places seven times during the 18 events. The two teams were tied for fourth going into the final event - the 1,600-meter relay - but Blue Earth took second in the relay to claim fourth place while the Dogs ran fourth and finished fifth as a team. The Dogs (344 points) were six points behind Blue Earth (350) in fourth and ten behind Cedar Mountain/Comfrey/Springfield (354.5) in third. With better, deeper teams at state, the Dogs averaged 19 points per event (compared to 28 points per event at sections). The Dogs scored 20 points or more in only eight events (compared to 17 of 18 events at sections). At sections, the Dogs had 12 top-five individual finishers and scored 30 points or more in eight events. At state, the Dogs had only four top-five individual finishers and scored 30 points in only one event: the pole vault. Ninth grader Anna Kotten cleared 9' in the pole vault to take second at the true team meet for the highest individual finish for the Dogs. Junior Kacy Nehowig, who only recently returned to competing in this event, did not miss in clearing 8' and then cleared 8' 6" on her final attempt and took sixth, giving the Dogs 30 points. Both Kotten and Nehowig had personal bests in the pole vault at the meet. Kotten clearing 9' is the third-best vault in school history, behind school record holder Missy Bachman. The pole vault, held indoors and scored as the 15th event on Saturday, gave the Dogs their last lead over Blue Earth by three points. The Dogs' next best event was the discus, with sophomore Natalie Leadem taking sixth, with her second best throw ever, and junior Randi Schaefer taking ninth. They scored a combined 23 points. Other events in which the Dogs scored 20 or more points on Saturday were: 100-meter dash (22 points); 400-meter dash (22 points); 300-meter hurdles (21 points); 1,600-meter run (21 points); 3,200-meter relay (21 points); and 800-meter run (20 points). The Dogs scored 19 points in the 100-meter hurdles and the 200-meter dash. The 3,200-meter relay team improved their season best time by 14 seconds in placing third, a pleasant surprise to the PAHS team. Relay members were sophomore Melanie Koerner, ninth grade Erin Guzy, junior Tanis Beireis, and sophomore Kaitlyn Frenchick. Other top-five finishes for the Dogs were: in fourth, 1,600-meter relay (ninth grader Bri Jaeger, ninth grader Linda Keller, Guzy, and Frenchick); and in fifth, Kotten in the 100-meter hurdles; senior Tara Schmidt in the 100-meter dash; Keller in the 1,600-meter run; and the 800-meter relay (junior Kirsten Miller, Jaeger, ninth grader Stacy Orbeck, and Schmidt). Kotten also placed sixth in the 300-meter hurdles. Other top-ten individual finishes for the Dogs on Saturday were: in seventh, ninth grader Kally Felling in the 400-meter dash; Frenchick in the triple jump; and Schmidt in the long jump; in eighth, Keller in the 800-meter run and Schaefer in the shot put; in ninth, Felling in the 200-meter dash; Jaeger in the 400-meter dash; and Nehowig in the 3,200-meter run; and in tenth, Schmidt in the 200-meter dash and Frenchick in the 800-meter run. Other personal bests for the Dogs at the meet were: Orbeck in the 300-meter hurdles; Beireis in the 3,200-meter run; and eighth grader Krista Topp in the triple jump. Pictures of state true team meet. Pole vault: Kotten, second, 9' (personal best); Nehowig, sixth, 8' 6" (personal best); 30 points.